My first preview features Melinda's cute snail. I simply had to use it first, because it is sooo cute. Have you ever seen a cuter snail? The sentiment is from Stampin' Up and I loved how it goes with the stamp. I coloured the snail with Copic Sketch Markers and cut it with Spellbinders round petite Nestabilities. The lace is from my local craft store, I sewed it to the cardstock. Meine erste Vorschau zeigt Melinda's süße Schnecke. Ich mußte sie einfach als erstes verwenden, weil ich sie sooo unheimlich süß finde :) Habt ihr schon mal eine niedlichere Schnecke gesehen? Der Text ist von Stampin' Up und mir hat sofort gefallen, wie das Design und auch die Bedeutung mit dem Stempel harmonieren "Liebenswürdigkeit kommt in vielen Gestalten, aber immer von Herzen". Coloriert habe ich die Schnecke mit Copic Sketch Markern und ausgestanzt mit Spellbinders round petite Nestabilities. Die Spitze habe ich von meinem Bastelladen um die Ecke. An den Cardstock habe ich sie mit der Maschine drangenäht, da sie zum Kleben zu fein war. 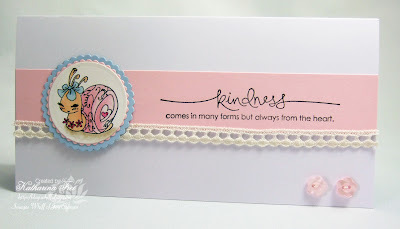 Paper: SU cardstock "Pink Pirouette and Bashful Blue"
What an adorable snail!!! and this is only the first preview...can't wait to see the next one!!! Oh, this is sooo adorable! How cute can a snail be? I love it!! The colours you used on this card are beautiful. Adorable, look at those fab eyelashes. Beautiful card. 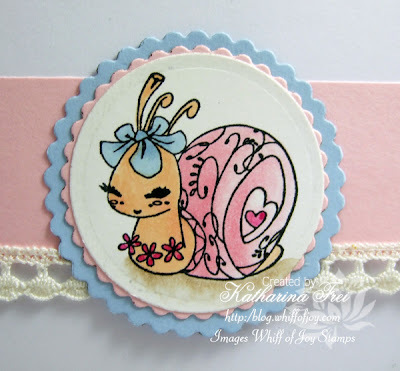 I saw the cute snail on Sonja's blog this morning it is sooo adorable!!! Definitly want it now!!! OMG is so cute!! No, I have never seen a cuter snail!! ich freue mich schon auf die anderen motiven. That is a very cute snail! Can't wait for the new releases! Adorable card and cute snail! Oh my, that snail is adorable!! Love your card Katharina! That is the most adorable snail I have ever seen. He is just toooo cute. Die ist ja supersuess geworden... klasse wie du die gestanzen Kreise angeordnet hast! OMG this is the cutest snail ever!! I can't wait to see the rest!! What a sweet card, the sentiment is perfect with the cute snail. Love the lace. what a beautiful card Katharina,l love the image. die Schnecke ist ja absolut süß. I love snails and this one is supercute!!! love it! And I love other stamps, I've seen in DT's blogs. This is soooo cute. Can't wait to see more stamps. Oh this is just so very beautiful! OHHHH Katharina, This is absolutely Beautiful. I have already seen one of the Melinda stamps used in a couple of places, and they are darling!But this little snail is just to die for. I can't wait until tomorrow to see more. das Motiv ist wirklich superniedlich und Deine Karte ist sehr edel geworden, wunderschön. Hmm ... this looks pretty darn cute ... Can't wait ... I'm DEFINITELY going to have to bring my laptop with me this weekend when we leave town just to keep peeking. Thanks for the sample! Love it! What an adorable little snail. You've made a lovely card to match! oooh ist das ein zuckersüßes Motiv und so klasse coloriert - ich fiebere dem Sonntag entgegen !! !